Set of box making squares-designed to assist the box making enthusiast! The Gifkins set of box making squares are specially designed by us to assist the box maker and small joinery enthusiast. A set of box making squares is an important box making accessory. 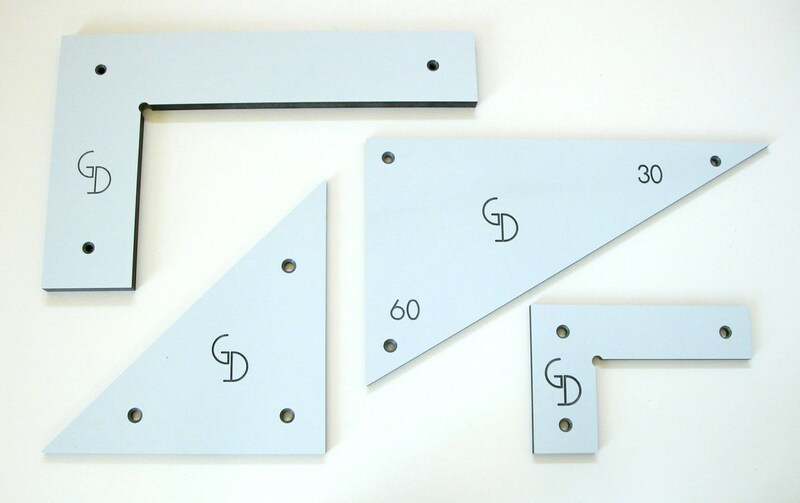 Each square is machined from compact laminate using a five step process on a CNC router, and guaranteed accurate to ±0.05mm. The small 90 degree square. Use it check for 90 degree angles before glueing your small box frame. a 45 degree triangle. Use this triangle to check for 45 degree angles when cutting the miters on a frame-and-panel box lid. a large 90 degree square. Use it to check for 90 degree angles on the outside corners of larger boxes. The box making squares can be purchased individually. Also see other box making products, like the Bessey clamp and customised clamp holders. They offer safety and ease-of-operation when using the Gifkins jig.